Yuca is a root vegetable, also known as cassava and manioc root. It can be peeled and boiled just like potatoes, and it's a staple food in many parts of South America. 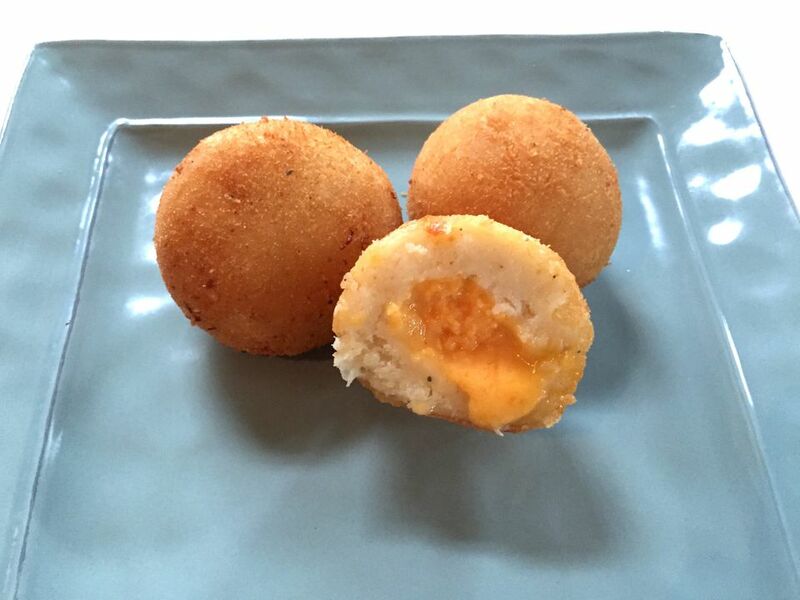 These crispy little balls are made by shaping the mashed yuca around a piece of queso fresco, then rolling them in bread crumbs and frying them until golden brown. The result is a crispy shell around a soft starchy filling, with melted cheese in the very middle. Fried yuca balls are excellent dipped in salsa a la huancaína, a spicy cheese sauce. Bring a large pot of salted water to a boil. Peel the yuca root and cut it into 3 inch long pieces. Add the yuca to the boiling water and cook for about 30 to 40 minutes, until the yuca is very tender and can be easily pierced with a fork. It should be fall apart when poked with the fork. Drain the yuca in a colander. Remove as many of the woody stems from the center of the root as possible. Pass the yuca through a potato ricer, or force it through a colander, to remove any remaining fibrous strings. Season the mashed yuca with salt and pepper to taste. Let cool for 10 to 15 minutes. Place 2 tablespoons of mashed yuca in the palm of one hand. Make a small well in the middle, and place a piece of cheese in the well. Wrap the mashed yuca around the cheese, and roll between your hands to make a round ball. Repeat with the remaining mashed yuca. In a deep skillet or deep fat fryer, heat 2 inches of vegetable oil to 360 degrees. Fry the yuca balls in batches until lightly golden. Drain on paper towels. Crack 1 egg into a bowl and whisk lightly with a fork. Process the bread with the crackers. Roll each ball in the egg and then in the bread/cracker crumbs, until well coated with crumbs. Fry the yuca balls a second time, just until they are golden brown and crispy. Drain on paper towels and serve warm with huancaína sauce for dipping. Note: Yuca balls can be kept warm in a 200-degree oven for 30 minutes until ready to serve.